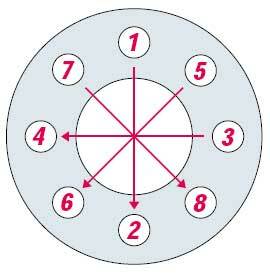 The spiral wound function is based on the metal winding/ filler relationship and the flange surfaces. required to permit a flow of the PTFE in the irregularities. Insert the gasket and fasten bolts finger-tight. (see sketch) in at least 3 to 4 passes. Do not use separating agents or sealing aids!